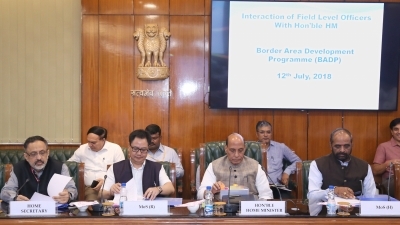 New Delhi July 12 (IANS) Union Home Minister Rajnath Singh on Thursday reviewed the ongoing development programme being run in 17 states located along the international borders an official said. Chairing the meeting Rajnath Singh interacted with field-level officers to review the Border Area Development Programme (BADP). Union Ministers of State for Home Hansraj Gangaram Ahir and Kiren Rijiju Union Home Secretary Rajiv Gauba Special Secretary Border Management B.R. Sharma and other senior Home Ministry officials were present at the meeting. The BADP began in 1986-87 and initially aimed at the special development needs of areas bordering Pakistan such as in Jammu & Kashmir Punjab Gujarat and Rajasthan. The programme was later extended to all land borders. The BADP has been implemented through 17 states -- Arunachal Pradesh Assam Bihar Gujarat Himachal Pradesh J&K Manipur Meghalaya Mizoram Nagaland Punjab Rajasthan Sikkim Tripura Uttar Pradesh Uttarakhand and West Bengal. International borders fall in parts of these states. Thousands of people live in inaccessible areas along the international borders. The funds under BADP are provided to the states as 100 per cent non-lapsable special Central assistance. The programme is supplemental in nature and the estimated budget allocation for the financial year 2018-19 is Rs 770.97 crore.